Grundfos has a strong tradition of social and environmental responsibility with one simple aim – to make a positive difference. Grundfos is committed to doing business in a responsible and sustainable way. Grundfos designs and manufactures pumps that demonstrate respect for the environment through energy efficient designs and use of selected sustainable materials. From demand-driven water distribution systems to flood control, solar powered pumps and wastewater solutions; the company contributes to global sustainability by pioneering technologies that reduce the power costs, improve quality of life for people and care for the planet. While Grundfos makes its greatest impact with the pumps and product solutions it provides to their customers, it also implements sustainable solutions through local initiatives at their own facilities. At Grundfos Australia’s head office, located in Regency Park, South Australia, the company has recently completed the installation of a new rainwater harvesting system and invested in a 100 kW PV solar panel system. The rainwater harvesting system comprises of eight 40 kL tanks that collect rainwater from 1,500 square metres of roof catchment area. The harvested water is disinfected using ultraviolet (UV) technology, which means that no chemicals are used in the disinfection process. Once treated, the water is pumped using a Grundfos Hydro MPC-E Dual Booster system to all toilets and hand basins on the premises, as well as to all pump test tanks. 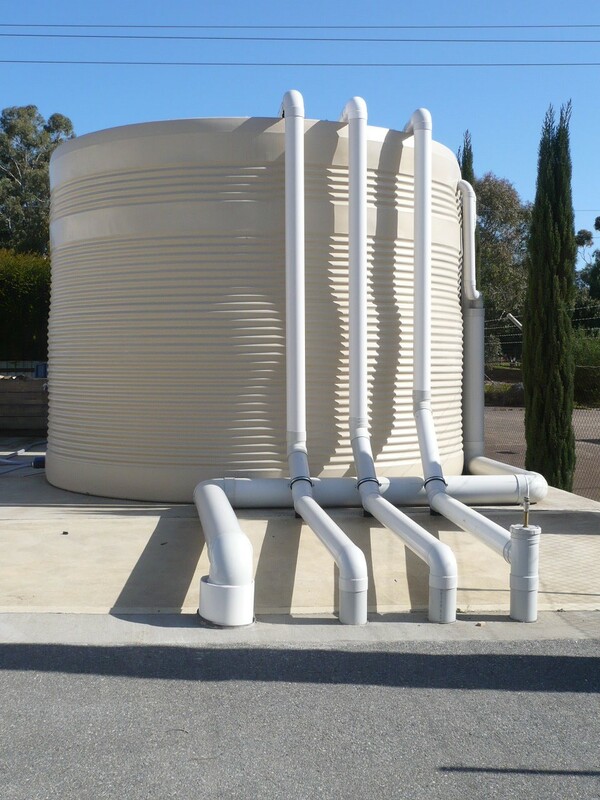 It is estimated that the implementation of this new rainwater harvesting system will enable Grundfos to reduce its municipal water use by 45% compared to 2008 levels, resulting in a realised saving of $7,650 AUD per year and 2334 m3 water per year. The installation of the solar panel system was a clear opportunity for Grundfos to have a result that affected a double bottom line; it could save a lot of money by generating and selling excess renewable energy and reducing its carbon footprint by using electricity generated from the sun. By investing in the solar panel system, Grundfos will be able to reduce its CO2 emissions by 50%, and make an energy cost saving of $43,486 AUD in year one (2017) and $780,699 AUD over 20 years. “These initiatives give us a double bottom line result by delivering positive outcomes to the sustainability performance and adding value with realised cost savings,” John Zarnke, Australia & New Zealand Quality Safety & Environment Coordinator, said. At Grundfos, sustainability is not just some company rhetoric; these are values that the company is willing to contribute time and money to, ensuring it performs at the highest level. Grundfos believes that through local initiatives, it can contribute to global sustainability. The harvested water is disinfected using ultraviolet (UV) technology which means that no chemicals are used in the disinfection process.